The AppCrayon by DanoToys is the first stylus I’ve ever seen with a triangular shaft designed by teachers and therapists for use by kindergarteners still working on their pencil writing grips. 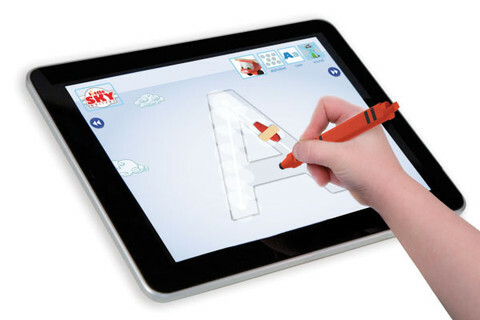 The stylus is plastic, slightly over sized and has a bit larger tip then most styluses making it perfect for kids. This stylus feels very much like a triangular crayon, but looks different enough that a child should confuse a real crayon for the stylus on the screen. Its designed with a small loop on the back to attach to a lanyard or hook if there are worries about misplacing it. The stylus is completely universal so even though it was designed in conjunction with an Apple app, the stylus can be used with over 300,000 apps and is compatible with nearly every touchscreen device. The AppCrayon was designed by educators for educators. DanoToys offers a special discounted classroom pack for teachers interested in using them in their curriculum. My son has problems with his fine motor control, he can only fist-grip writing utensils. We’ve worked with him in therapy, but with crayons and pencils he gets easily frustrated when using a tripod grip, because he doesn’t have enough wrist and finger strength to create marks on a writing page. My son also adores his iPad time. When I found this stylus in my pre-holiday shopping adventures, I thought it might be worth a try for him. In conjunction with the AppCrayon the DanoToys team has developed a free app for Apple devices to practice letter writing, AppCrayon . A second Apple app, Little Sky Writers , runs at $1.99 on the Apple App store, but with three levels of difficulty, three airplanes to personalize, and voiced by by comedian and star of Nickelodeon‘sTM Big Time RushTM Stephen Kramer Glickman, it’s well worth the cost. There is a $.99 Little Sky Writers if you plan to use the app on only on an iPhone. Once your child has mastered the game, they’ll receive a certificate of completion and the option of posting it to your Facebook page. When I sat my son down with the stylus and app for the first time, he was completely enthralled as I had expected. New things are exciting! I was impressed how he really had to think about how to hold the stylus and while I did have to remind him a few times how to hold it properly, he managed to keep a tripod grip for nearly an hour. I was highly encouraged! After buying a second stylus, the first one having been destroyed by one of my boys biting the rubber tip off because they thought it was food, I carefully watched my son use the stylus. With each use he would revert to the fist grip but would correct himself as if the stylus war more comfortable in the tripod position. I’m overjoyed at the sight of seeing him writing correctly. Of course this isn’t a true fix to his grip issues, but it is a great way to reinforce the proper grip anytime he plays on his iPad. I’d highly recommend the AppCrayon for any child with a touchscreen device, especially for young ones still practicing a proper pencil grip.